Race the Sun is a game with a simple concept – pilot a solar-powered ship across a landscape for as far as you can until the sun goes down, dodging the scenery and collecting as many gems as you can. Your score is measured in meters covered, and every five gems gives you a multiplier. Skim an edge of a piece of scenery and you lose your multiplier. Crash and you’re dead. It’s as simple as that. Pick up and Play: With Race the Sun, you’re straight into the game with as little messing around as possible. Start up the game and within two button presses you’re controlling your ship in the first stage. The game doesn’t bother telling you what to do, it just leaves you to figure out the mechanics, and that’s a valuable thing with a bitesize game like this. Simple mechanics: Most of the buttons on your controller won’t be pressed playing Race the Sun. You use the control stick to navigate, and one button to jump, if you have a jump equipped. That’s it. The simplicity adds to the pick-up-and-play nature, and it’s impressive the devs managed to keep things so basic. Depth: Despite the perceived simplicity, I found myself getting much better the more I played, getting further and further across the landscape each time, discovering new stages and beating previous high scores. It takes a while to get a feel for the weight of your ship and the subtleties of the twitchy controls, as well as appreciating the importance of collecting the multiplier gems. The learning curve and sense of gradual progression served to keep me hooked. Cool sounds: The soundtrack and sound effects do very well to keep things interesting and exciting. Dramatic thwangs and gongs boom out when your ship scrapes the side of an object and when you pick up a powerup, and the ever-speeding-up fast-paced music adds to the tension. Clever ways to level up: Race the Sun allows you to unlock various things, including perks, new ships and new game modes. The way in which you do this is by completing certain challenges of varying difficulty, such as ‘travel through a stage without getting hit’ or ‘collect 50 multiplier gems midair’. Some of these accumulate through various runs, whereas others have to be done within one run, and there are always three available – easy, medium and difficult, with the harder challenges yielding greater rewards. It’s a clever and satisfying system that succeeds in keeping the player hooked. Graphics: The simple, minimalist graphics do the job, but really they aren’t too inspiring. Everything is an angular polygon, and while the shadowing is quite nice, what it gains in clarity it loses in character. Its a style that might not suit everyone’s taste, and the lack of any bold colours also doesn’t inspire much awe. Sun is…annoying? It’s a strange criticism, as the whole point of the game is to get as far as you can before the sun goes down. However, I couldn’t help but feel the game would be just as fun, if not funner, without the solar powered factor. All it really does is serve as a time limit, and the power drops that give the sun a boost up are rather sparse in frequency, meaning at times you can be enjoying a fantastic run, only to be scuppered by a setting sun. Perhaps a no-sun option would’ve been a good addition. Limited environments: With the dev’s choice to have simple geometric graphics, I would’ve thought this would’ve served to allow for more varied environmental hazards and features, but sadly the game lacks in this department, with obstacles through most runs. Only the quirky and interesting portal zones, that you rarely access, display any sort of variety. No instant retry: Easily my biggest annoyance with the game came from the lack of an option to retry from the pause menu. For a game of this style, it needs to be as quick and as smooth as possible to restart a session – as a player may be going for a challenge, mess up but not crash, and want to give it another go. It’s a small thing, but an annoying one! 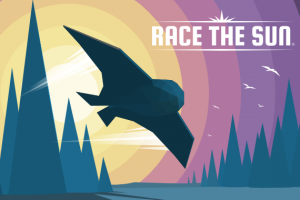 Race the Sun is an addictive and stylish pick-up-and-play indie game that succeeds in evoking the ‘just one more go’ hook that games of its type live or die by. The gameplay is simple but tricky to master, and the music and overall ambience is likeable. A few small design faults hold it back from being a classic, but it’s still worth a play if you enjoy beating high scores.